Do high wattage power supplies cost more to run? My brand new power supply doesn't work! Am I doing something wrong? Why should I buy a whole new PSU when I could just replace the noisy fan in my existing one? What is PFC (Power Factor Correction)? How do I know what size of wattage power supply I need? My new PSU came with a 24-pin connector but my motherboard needs 20 pins! Do I need an adaptor cable? What do the PSU safety protection abbreviations mean? 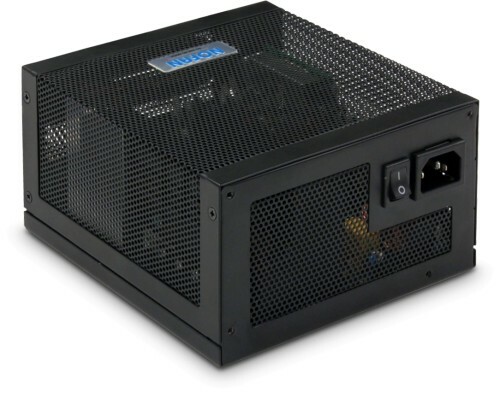 The ultimate ATX power supply for a silent PC - Nofan's amazing fanless 500 watt ATX PSU offers noise-free, dust-free, worry-free power for total reliability and complete silence. Nofan's famous IcePipe cooler looks set to change the way people think about combining powerful PC specifications with absolutely silent running, but of course there is little benefit to be had by using a fanless processor cooler if other components in the machine generate noise! Typically, the PC power supply is one of the main culprits for making fan noise, because usually its internal components generate so much heat that a fan is inevitably required in order to keep its temperature down. However, Nofan have taken a different approach with their new fanless power supply. It offers ample power and complete reliability and safety, even though it has no cooling fan whatsoever! It is designed primarily for excellent efficiency, which in itself reduces heat output because more AC power is converted to DC power with less unwanted heat being generated in the process. In addition, the whole of the base of the power supply is one big heatsink, as can be seen from the fins on it. By using a heatsink with such a large surface area, heat can be dissipated passively and without the need for forced airflow. Given that modern processors and SSD drives have ever-decreasing power requirements, the 500 watt continuous possible power output from this Nofan PSU will be ample for almost any PC. If a high-power 3D gaming card is installed, however, we would recommend that a conventional power supply be chosen because such graphics cards alone can easily consume 200-300 watts and sometimes more! However, for most people who are not 3D gaming enthusiasts, the Nofan P500-A represents an excellent investment for a silent-running, dust-free, reliable and long-lasting computer. This was by no means my first order from QuietPC, and it won't be the last! The PSU arrived on time, in perfect condition, and is genuinely completely silent. After a 24 hour "memtest" it's still running cool. It's a practical, well-designed PSU that - in addition to running silent - also looks surprisingly attractive (it's not often I'll say that about a piece of black metal hidden away in a PC!) Can't recommend it highly enough - and the same goes for the great folk at QuietPC. Well built, well packed fanless modular PSU. Supplied cables cover all the basics (PCIe, ATX 12v, SATA power, molex power, even an FDC power cable). Cables are nicely sleeved, and the unit is generally very well finished. Excellent power supply, completely silent, doesn't get too hot in use, more than enough power for most PCs, just a quiet click when you turn off. Highly recommended.